The London food and wine scene is a great place to be right now. Barely a weekend seems to pass where there isn’t at least one street-food festival, pop-up evening or craft beer/wine tasting. This is caused by a real up-surge in talented and enthusiastic gourmands who are able to find considerable success through their self-promotion on social media sites such as Twitter, Facebook and Instagram. 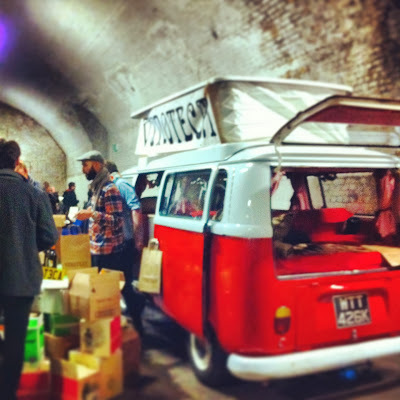 Last Saturday I attended the second Wine Car Boot event, a perfect example of this trend. They invited wine stores from London to create a stand in a London car park near London Bridge station and bring along some wine. Tickets were a very reasonable £10 and you could try any wine you wanted in exchange for a £1 coupon. The tagline for the event was “taste your way out of the supermarket”; trying to get wine buyers out of the supermarkets and into their local wine shops. To this end, the wine shops were looking to exhibit wines at the more affordable end of the scale. After all, it’s very easy to offer samples of wines that cost £80/bottle and say “don’t these taste lovely?”, but it's quite another matter to exhibit wines that display craft, finesse, style, weight, complexity, etc at the £10 - £20 end of the spectrum. The most expensive wine on display was a bottle of Premier Cru Champagne at £23.40/bottle; although it is worth noting that this was one of only two wines over the £20 mark. My first thought on entry was that I remembered being in this particular car park previously for a Drum’n’Bass night in my slightly more exuberant youth. The event had stalls from D Vine Cellars, Bottle Apostle, Roberson Wine, Market Row Wines, The Good Wine Shop, Vinoteca, Borough Wines, Last Drop, Planet of the Grapes and the Sampler. 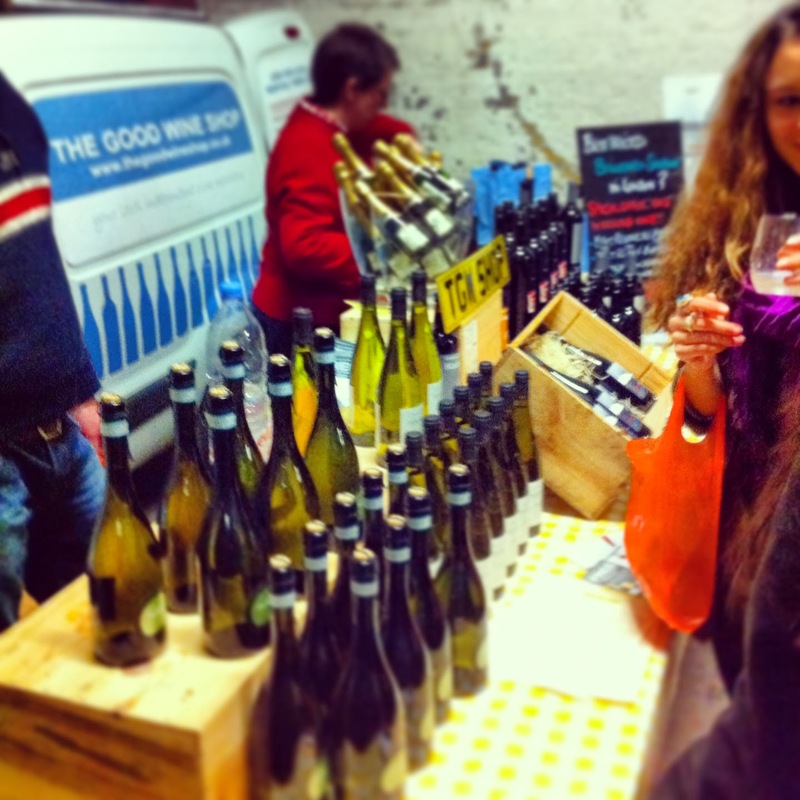 Ten stalls, each exhibiting five wines. That makes fifty wines in all (although I’m sure you’d already worked that out). I won’t reference all of the wines here, largely because I didn’t get around to trying them all; instead I will focus on some of the wines that I particularly enjoyed. Next was another Venetian wine, the 2012 Scuola Grande Rosso Veronese. This was a blended wine, 40% Corvina, 30% Merlot and 30% Cabernet Sauvingon; had a quite pronounced truffle/mushroom bouquet, but was light and refreshing on the palate with a soft background of tannins. The star here for me was their 2006 Marsanne from Chateau Tahbilk, Nagambie Lakes, Victoria. Given that this wine was seven years old it was amazingly fresh, with a distinct acidity running through it. For £15/bottle, this was a very pleasant and elegant wine that should continue to age well. They also had a very interesting 2012 “Young Wine” from the Thymiopoulos family winery in the upcoming winemaking regoion of Naoussa in Greece: made from the Xinomavro grape; this was dry, fruity and approachable. It’s always nice to try different grapes, from different wine producing areas of the world and this was a perfectly decent wine, priced at £12/bottle. Another couple of snappy gems here. Firstly their 2012 Fiano from Rootstock, Sicily; possessed a herbaceous nose, and a pleasingly mineral-driven taste. At £8/bottle, it represented fantastic value. The second was their 2012 “Lekanyane” Cape Hunting White from Painted Wolf, South Africa (£11/bottle). This was a 60% Chenin Blanc / 40% Viognier blend, which seemed to give it a very interesting floral and vegetal character. If anyone read my wine about Wine Tasting on the Costa Brava, you’ll know that I have become a big fan of Mourvèdre/Monastrell wines and, in particular, their sweet wines; so I was pleased to find a 2010 Natural Sweet Mourvèdre from Adoro in the Western Cape (SA) (£13/bottle). This tasted nicely of tangy fruit and sour cherries, was not overly sweet and very drinkable. Californian Zinfandel’s have been a recent revelation for me so I was delighted to find the 2009 Heavyweight Old Vines Zinfandel from Lodi in California (£11.25/bottle). Whilst not the most complex or finessed wine in the world, this was certainly big, bold and fruity with a decent whack of tannins; it would go well as a food match with a hearty stew or a roast dinner. I also couldn’t resist trying the aforementioned NV Clos de La Chapelle 1er Cru Champagne, which was a Pinot Meunier driven Champagne – fruity and not overly toasty. Not really a “special occasion” champagne, as such; more a decadent, “I feel like some bubbles for the hell of it” Champagne. As you can hopefully see from the above, there was a varied and interesting selection of well-made wines, at very approachable prices on show. There was also a very convivial atmosphere, with great food stalls to help soak up all the alcohol. All-in-all this was a perfect way to spend a Saturday afternoon and, to cap it all, I came away with a rucksack of excellent wines without having to spend a huge amount of money. When Wine Car Boot 3 is on, I will be first in line for a ticket! Although it isn't simply the expense of energy. This can be a cycle problem. The costs connected with many techniques from foodstuff and typical basics to leisure, additionally increase, and there appears to be no result in sight.